The sky was starting to overcast and I felt a couple of drops of drizzle falling on my head. That was my cue to cut short the tour of the Forbidden City and call it a day. Besides, I was going to come back to visit another day anyway, since there is no way to complete the tour even if I had stayed on. So I inched my way out of the Forbidden City (I don't know why they narrowed the exit paths so much that it was an extended bottleneck just to get out) which took me about what? 20 minutes just to get out? It was stuffy in the line with everybody breathing down on everybody else. I was welcomed by a refreshing breeze the moment I stepped into the open at the end of the exit back onto the main street. 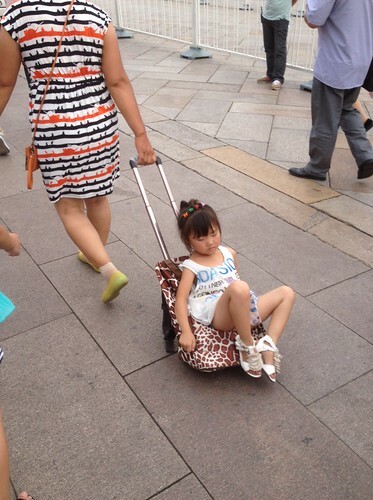 This is when I saw this little girl perfectly perched on a shopping dollie, pulled by her mother. You can tell she is dozing off with the constant nodding. Jerk awake, regain balance, eyes heavy, snooze, falling off, jerk awake, regain balance. Rinse. Repeat. It was most amusing as other people and I behind her watched. Then I took the photo of this cute little girl.